On Midsummer Eve, I had the pleasure of photographing a confirmation in Ammarnäs. 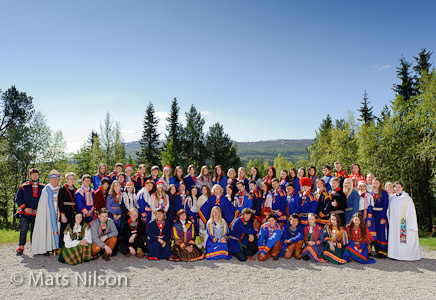 There were 44 young Sami from all over the Swedish part of Sápmi, all in traditional Gákti dresses. The bishop was there, too! 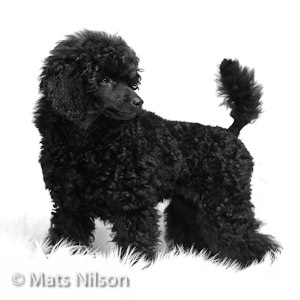 matsnilson.com - now in Swedish! Having been exclusively available in English for the last couple of years, my home page is now also available in a Swedish edition. In addition, I've taken the opportunity to expand a bit on the 'Galleries' section. 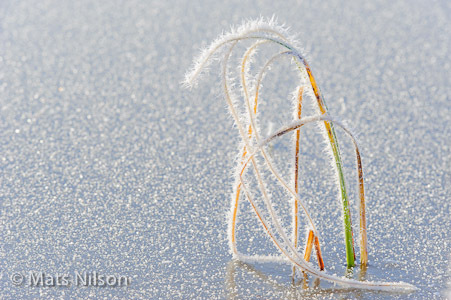 My photographic output has been rather low this winter, but as spring gets nearer I expect to be up and running again. This year carries a lot of promise for exciting new projects, and this is where you'll hear about them first!. In December, Siri the Jack Russell Terrier and the rest of us got a new family member - Wera the Poodle. Ain't she cute? 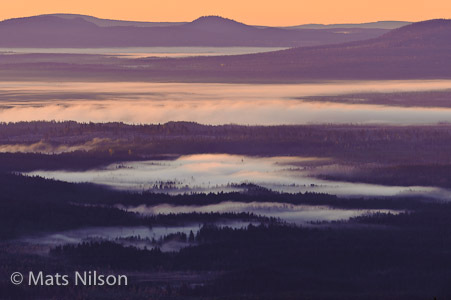 Because of rather dramatic events in Swedish nature photography this autumn, I thought it best to declare where I stand on the issue of honesty in nature photography. You'll find this in the section Image Ethics on my Info-page. 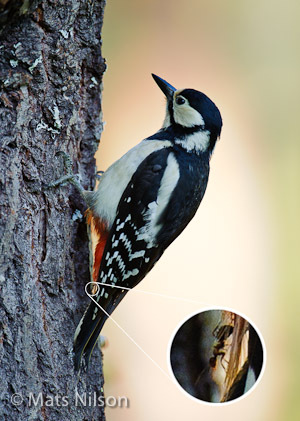 As I went through some images from this summer, I suddenly saw a little stowaway on this female Great Spotted Woodpecker! The AF-S II Nikkor 600/4D ED-IF is a sharp piece of kit, and chance put the wood ant in the same plane of focus as the woodpecker's eye, on which I focused. 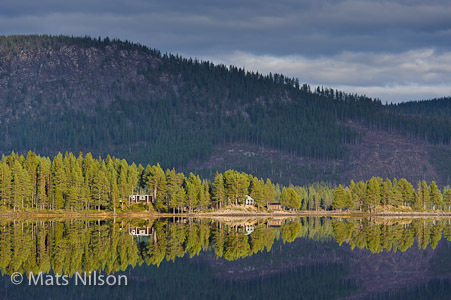 Still no snow, but temperatures have dropped and most of lake Storvindeln is now ice-covered. Skies were clear today, and the sun stood low in the sky, so I decided to take a short hike into a pine forest I discovered recently. It's a lovely, mysterious place and I'm sure I will spend lots of time there in the future. Still no sign of winter..
Winter came - and went again.. Last week's cold spell was followed by rain, fog and grey skies. 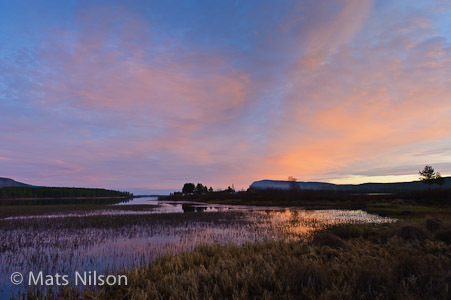 Today, however, the sky is clear and painted in the most delicate shades of pink and blue. The sun is due up any minute, which is at a good deal more humane hour than in summer, and I know precisely where I ought to be to catch it all! But I'm not. Instead, I'm waiting for plumbers to install a new heating system in my house. And of course the rest of the week is set to be rainy, but they had to pick today, hadn't they? The last couple of days have been rather cold and foggy. That's the recipe for hoar frost! All the trees are covered in white, which is spectacular, but also little reeds sticking out of an ice-covered pond deserve to have their portrait taken, methinks..
Having spent most of the last six months on the northern shores of lake Storvindeln, I decided to drive up along the south side today. And it was the most astonishingly beautiful day! Winter is waiting around the corner, but today it was rather warm and, as you can see, not the slightest breeze! 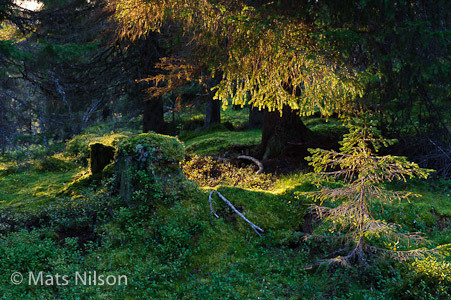 Where I live, in northernmost Sweden, there are endless spruce and pine forests, interspersed with bogs and mires. But are they in fact endless? Unfortunately, they're not. 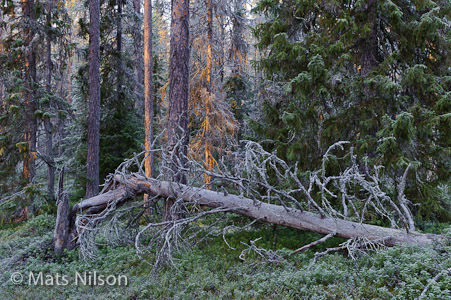 In almost every forest, regardless of how pristine it might seem, signs of human impact are obiquitous. And what little remains of comparatively old forests are as often interspersed with clear cuts as with mires. The photograph below is one I wish I hadn't been able to take. If it weren't for the logging road leading to this stamp-sized remnant of old spruce forest, I would probably never have found it.. I just realize it's been two months since I last wrote anything here. I ought to be ashamed of myself! :) The thing, though, is that I'm rarely by my desk this time of the year, and that, I suppose, is a good thing. At least for me..
Photography-wise I've been scouting places to build photography hides, which has taken quite a lot of effort - and I'm yet to build any hides..! 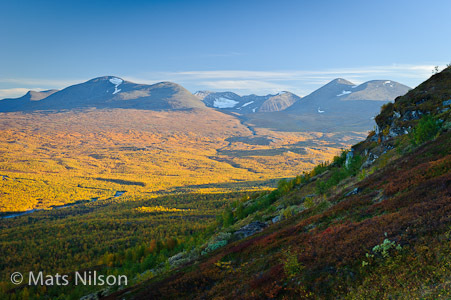 I had originally planned to go back to Abisko this autumn, too, but that has been put off. But there's no shortage of autumn images to be had around where I live, so.. This week I've had salmon trout for dinner most every day, except one when I had lavaret. My girlfriend, my daughter, and I, go out onto lake Storvindeln at night to fish for trout and have so far been rather successful (and sleepy in the morning..). The other day, however, the people on a neighbouring island invited us to take part in their seine-fishing. You put out a long net in a semicircle from a boat, and then pull it in from the shore. Ancient practice, effective, and quite an event! 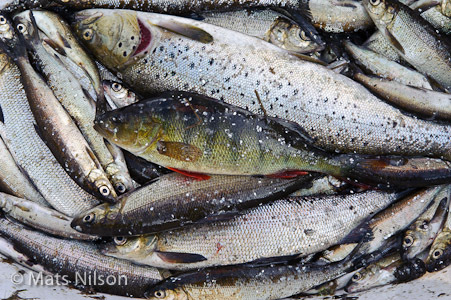 The catch consisted of one perch, one trout, and lots of whitefish in various sizes. These were then gutted (oh, I'm so sorry, I have to document this, can't soil my fingers, you know..) and boiled in a big pot and then eaten with potatoes and butter. Tastier than you can even imagine! First thing, as I entered the forest clearing where the Short-Eared Owls are nesting, the male decided to take a closer look at the intruder! Unfortunately, it seems the Great Grey Owl didn't succeed to raise any fledglings. Their choice of nesting place - on top of a chimney - might have been less than ideal, exposed as it was to the elements. 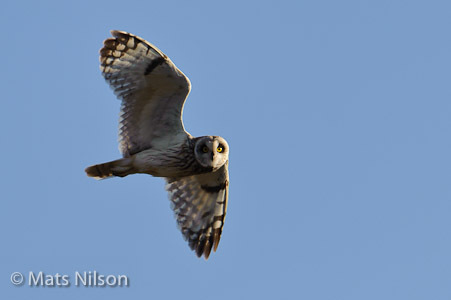 Instead, I received news of nesting Short-Eared Owls not far from where I live. 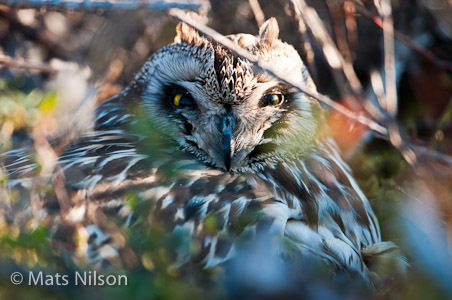 While the female, nesting under a heap of twigs, could be approached quite easily, I didn't want to disturb. I just got this image from some metres away, and then left her to brood in peace. 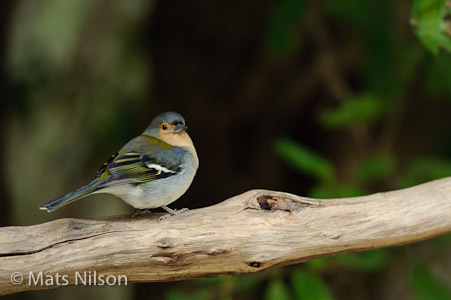 If I can, I would like to try and get some images of the male in flight, though, as it hunts for voles in a forest glade. Today, the subject is of a different kind altogether. An hour from now there's a wedding in Sorsele church, so I'd better jump into my suit and get going! I'm sorry for being such an infrequent blog-poster, but I've been rather busy doing all sorts of things lately. I've also been following the nesting of a pair of Great Grey Owls. The female has sat on her eggs for quite some time now, but I have yet to photograph any hatchlings. I'll post some images here in due time. 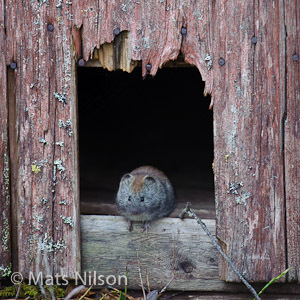 Within twenty metres of the owls' nest, I found this little fellow watching me as I was watching the owl. Dangerous place for a vole one would think! Two and a half weeks in Crete went much too fast! But, to be honest, it's really nice to be home again. We were greeted by the curlew as we disembarked in Umeå, and then by a Tengmalm's owl when we finally stepped out of our car in Sorsele at half past one in the morning. 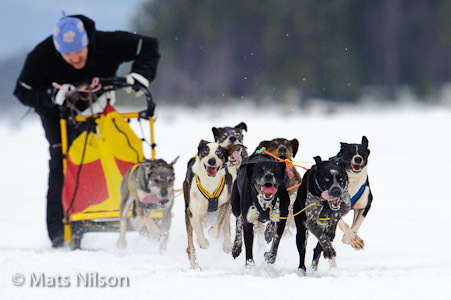 It's spring in Lapland and it's good to be back! Our trip to Madeira in December was ridden with all sorts of trouble, but this time everything went unbelievably smoothly. The weather was nice enough - even if I it wasn't always conducive to the kind of photography I had envisaged - and the Cretans were a hospitable lot indeed! I will now have to go through all the images, but as usual I think I'll leave it for at least a couple of days so as to get some distance. 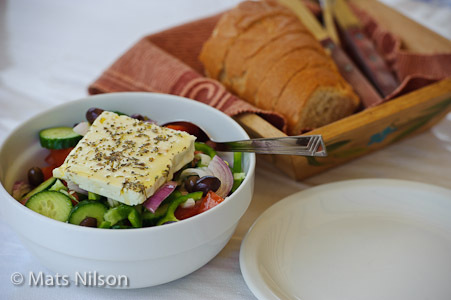 We carry lots of fond memories and one thing that I'm sure will have made a lasting impression is the Cretan cuisine! Today something highly irregular happened in my office. I unboxed a new lens! Now, that in itself isn't all that irregular (just ask my wallet), but for once it didn't say Nikkor on the box. What?! WHAT?!?! Yes, well, as you may have noticed, I'm quite into photographing little details, but so far, I haven't had a 1:1 macro lens. I do have the PC Micro Nikkor 85/2.8D, but that only goes to 1:2, and besides, I find its focal length a bit on the short side. Which is why I asked the nice people at SWEFO to send me a Sigma 150/2.8 APO Macro EX DG HSM. From what I've heard, it's a great lens and at a third of the price for a Micro-Nikkor 200/4, I think it's absolutely worth a try. So now I have a couple of weeks to get to grips with it until I can put it through its paces on Crete. Stay tuned! 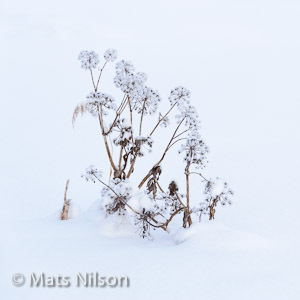 The thing about spring in Lapland, is that there's a distinct lack of spring flowers. Spring up here is not what you would be used to if you come from the south. Instead of a profusion of flowers, we have one of returning migratory birds. And any day now, I expect the first few might show up, even if most of them are sensible enough to wait until it's warmer and there's more to eat later on. What do you do when you come home with brimful memory cards? Upload them to your hard drive and congratulate yourself to a good day's work? That's what I usually do. At least after having had a quick look through the masterpieces on my big screen. But are they all masterpieces? Of course not! So do you delete the rejects? Do you rate the keepers and give them keywords? You should, you know.. Because if you don't, and save that work for a rainy day, you might as well consider moving to Cherrapunji.. Right now, there's a rather spectacular solar eclipse visible from where I live. Or so they say.. The skies are crystal-clear overhead, but there's a bank of clouds on the southern horizon. Oh well, there's supposed to be another eclipse in four year's time..
Next time I'm traveling on foot.. Anyway. Madeira can be recommended! There's beautiful scenery everywhere. If you go there, bring every memory card you own, a sturdy tripod, and an alert eye to the pictorial possibilities that abound around every bend of the road - and there are rather a lot of those! I'm on Madeira. Lovely place with lots of beautiful scenery to photograph! And the weather's been lovely all week! But right now I ought to be in Munich on my way home. Thanks to Spanish air controllers on strike, however, my girlfriend and I are stranded for God knows how long. If the airlines know, they don't let on. Not a word.. It could have been worse, though. I know, because it was on the way here. Firstly, the Nextjet flight to Stockholm was cancelled for dubious reasons. Bus 120 kms to Ume\345. Norwegian flight to Stockholm delayed. Miraculously, the flight to Frankfurt was several hours delayed from Stockholm, so a mixture of charm and threats got us onboard that, hours after it should have left. There our luck ended. I thought an airport was a place with an above average concentration of meteorologist, but apparently Frankfurt had been taken by surprise by a blizzard. So just about all flights were cancelled and no information given. Nine hours and a lot of running between gates later, we got onboard a flight to Lisbon where we arrived at 3 AM and were shuttled to a hotel where we were allowed the mercy of three whole hours' sleep. Taxi Kamikazi-style to the airport in the morning where our new flight to Madeira was - that's right - delayed.. So now we're just waiting. If we knew there'd be no flight today we could do something useful, like capturing more images or just getting mildly drunk. But there's no information. This is what I dislike about air travel..
Ooops, what have I done..? 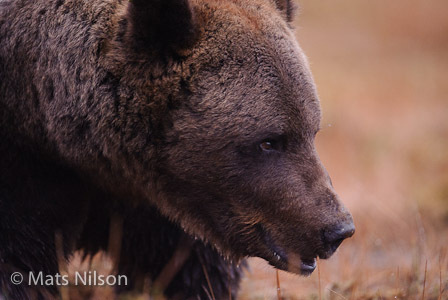 I spent last week with Peter Lilja in no man's land on the border between Finland and Russia, where Finnish photographer Lassi Rautiainen has been feeding and photographing bears, wolves, and wolverines for a good many years. Home again! Uneventful drive south through northernmost Sweden. 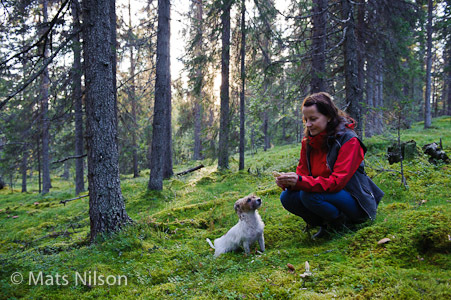 And I've had some quite decent days in Abisko National Park. The weather was, well, binary.. Either it was glum and miserable, or bright and cloudless. Not necessarily what you might wish for photographically.. According to the weather forecast for today, there would be a fog this morning. Excellent! If one is able to get above it, there are often nice images to be had. But when I got up at half past four, there wasn't a trace of fog in the air.. I consulted the forecast again, and it said there'd be fog by five. I looked out the window again, and what do you know? 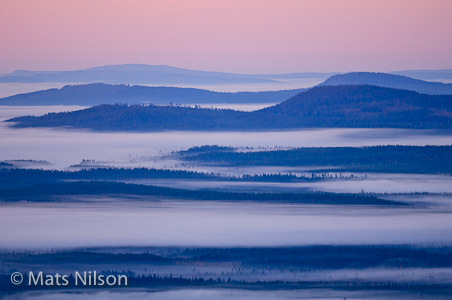 Faint wisps of fog materialized out of thin air as I watched. No time to waste! 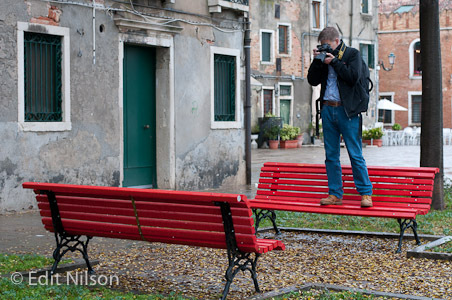 Today's weather went beyond inclement, and well past miserable, so photography didn't feel particularly appealing. Instead I drove all the way to Medle, near Skellefteå, to visit colleague and friend Peter Lilja. Being a photographer in this part of the world can be rather lonely, but a nice chat with an affable colleague makes it feel a bit less so. I know, you guys at Nikon probably don't subscribe to my RSS feed.. But if you do, I would strongly urge you to update the AF Micro-Nikkor 200/4D IF-ED. Also, how about making extension tubes that actually work with your current lenses and DSLRs? The good thing, you see, is that if you do, I promise I'll buy them! It's just that I'd need them sooner rather than later..
A couple of things combined to make today a complete success. 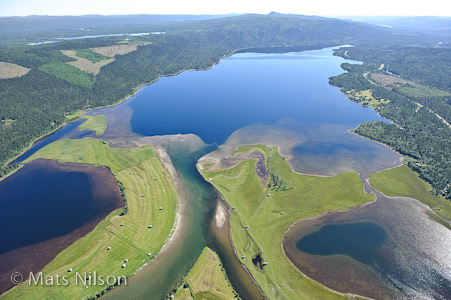 The assignment was to photograph the river Vindelälven from the air for the fly fishing centres of Ammarnäs and Kraddsele. The weather - Not a cloud, dead calm and not particularly hazy made for even light and a clear view of the river, even through the water. The Eurocopter Colibri 120B - (skillfully flown by Fjällflygarna in Adolfström) is the ideal tool for aerial photography. It's relatively vibration free and the back door on the left side slides open to give you an almost completely unobstructed view. The di-GPS - which, when connected to the camera adds coordinates to the EXIF-data of every image captured, makes it a breeze to know exactly where each image was taken. The Nikon D3 - of course! which lets the photographer concentrate on framing while taking care of exposure, automatically adjusting ISO as necessary to always keep shutter speed short enough to avoid adverse effects of camera shake. The extremely low noise levels of the D3 makes this a very viable option indeed. Oh, I suppose there might have been a fifth factor, but modesty prevents me from mentioning it..
A rather eventful, if unproductive, summer is nearing its end. My fab daughter is back after holidays with her mum, and we're trying to get our life in gear again for school and work respectively. The worst of the mosquito/blackfly onslaught has abated somewhat, so now I'm looking forward to getting out again with my cameras. Let's hope for a clear and colourful autumn! 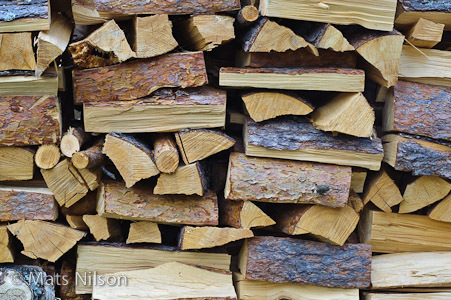 What do you do when a pile of firewood stares at you? Stare back! And preferably through a good close-up lens. Thanks, Elin and Johannes, for providing a wealth of subjects not 200 metres from my doorstep! Just got back from one of those. Lovely night, if not particularly productive. 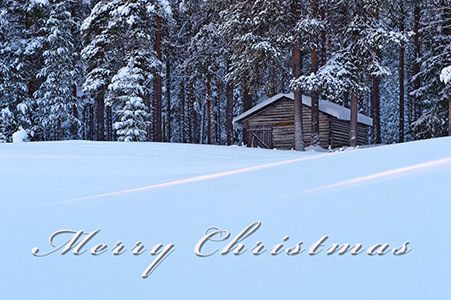 But then, a pleasant drive through rural Lapland is never wasted! A brief look through tonight's images does hint at a few keepers. 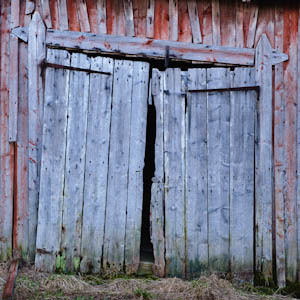 The one I've chosen to show here could have been made any time, really, but I hadn't seen this particular barn door before, so..
And now for some sleep! 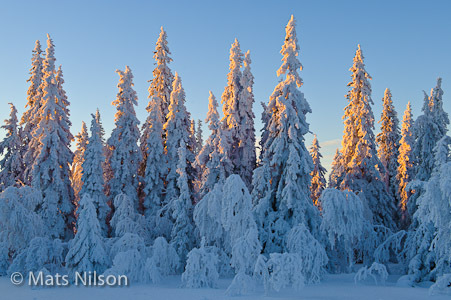 The good thing about being a photographer in the Arctic in summer, is that the light is fabulous for so many hours a day. From the sweet afternoon light, via dusk, which seemlessly changes into dawn, and further on into morning light. The bad thing is that there is no obvious time of the day for a photographer to get some sleep..
Last night seemed very promising. The rain was pouring down during much of yesterday, but the skies cleared in the evening, promising fairy-tale mists rising from meadows and the like. But then, late at night, winds started to blow, effectively ruining much of the magic and spoiling my inspiration. A different, emptier kind of summer.. The summer has finally reached all the way up north to Sorsele. The trees are leafing, one species after another and the nights are as bright as daylight. The air is filled with birdsong and all of nature is absolutely teeming with life, joy and exaltation! Yet, there'll be someone missing this summer.. I'll miss you, Hugo, but I know you're better off now. You'll always remain in my heart..